It’s been a busy week for me. I know that I end up saying that most weeks, but this week was busier than most at my day job. I had a class to teach and a lot of busy work to get done. I’m three days from being able to claim I wrote a poem a day, every day, for NaPoWriMo. Not all stress is bad stress! By yesterday I was almost completely burned out on day job and really needing to find a way to center myself and get my muse back on. I took a longish lunch (who knew longish was really a word!) and went to a local indie bookstore that is always good to spend time in and soak up the atmosphere. I rarely buy any books there, sometimes one of the eclectic journals to write in, sometimes an artsy fartsy pen, but the books I end up promising myself for later. The floors are well worn wood. The shelves are randomly placed. The stairs to the second floor are wide and winding and the tread shows the marks of thousands upon thousands of visitors. There are backpacks (locally made) and gypsy skirts hanging, cases of local artist art work and Buddhist and Hindu statues. And the incense that fills the air adds to the feel. The ambiance of the place is as much what I go for. And it works. It never fails to help me find the place in myself where I can be still and connect with myself and remember why I am who I am. Why I write. It quietly calls to my muse. This is how I find the time to connect with myself. What is yours? Find the place, your back yard, a park, a flower garden or beside some running water, where you can connect with yourself. Somewhere that you can go (even a somewhere within yourself if you can find the stolen time to go there) that can replenish your soul. I know that, as writers we are supposed to be able to take all of those stolen moments and use them productively to write. This is especially true when we are busy writers with other busy lives. 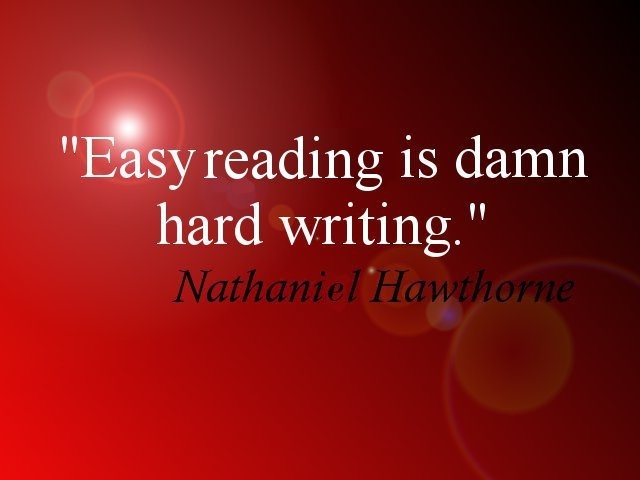 Nurture yourself and your writing will show the results. But sometimes the most productive thing you can do for yourself is find that place and go there to nurture yourself. Sometimes, it can be a place where you escape to do your writing. When that is the case, it is the best of both worlds. But when you can’t use it as your writing space, escape there whenever the need arises. Capture the look and feel. Take pictures or video. We all have phones with us all the time; why not make use of it? Use the pictures on your vision board or your computer as a gentle reminder. Be gentle with yourself, fair writer, and do whatever it takes to keep yourself on this wonderfully, sometimes stressful, magical road we find yourselves walking together! I’m not as great as I think I am. I know that, of course, but I forget sometimes. I’m not great. I’ll always know I’m not perfect, but I’m not great either. I’m not as bad as I think I am either. I want to be great. I want to get better in my craft. I don’t want to be sidetracked by my delusions of grandeur, nor depressed by my realizations of worthlessness. I want to get at the writing without all of this piling up on me. I want to tell myself every day, before I start writing: “You aren’t great. 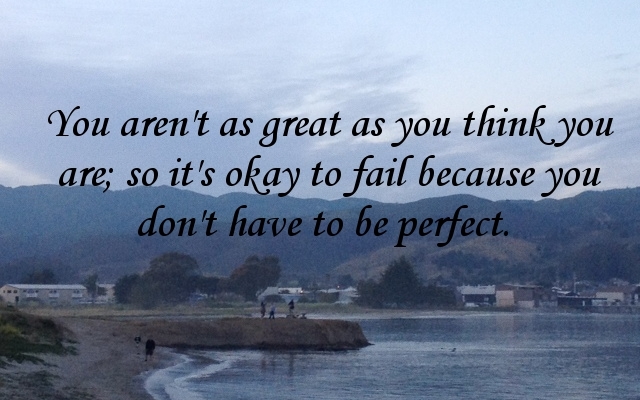 That’s why it’s okay to fail.” Because, when I think I am great I need to be great or perfect or marvelous or whatever. I get hung up over the details. I stop writing because I’m done, I’m great, I don’t need to get better. Perfect is a myth. Failure is human – it means you’re on the right track. You’re not as great as you think you are. I think we don’t understand the Internet. We made it, but we don’t really get it yet. We live in a very strange world. A world where anyone can to speak to anyone else whenever they want. A world where someone can write something and have it immediately accessible to anyone anywhere. Where almost all of human knowledge is available for instant perusal whenever needed. I speak, of course, of the Internet. Internet, that great and terrible god, savior of arguments and battleground of thirteen year old commenting trolls. And what do we use it for, this awesome power? Sad to say, mostly LoLcats. You’ve heard it said, and it’s true. We can access all human knowledge and create a collective genius hive-mind, but we’d rather sit and wonder whether a small feline will ever achieve ‘cheezburger’. Fine then, says you, what should we use it for? Obvious, says I. Writing. Before long distance communication, if you wanted to speak to someone far away, you had to shout. The louder you could shout, the more people would hear you. That was then. Today, it’s as if all of humanity is packed into one massive room, and everyone has a microphone. Each person can be heard anywhere in the room. But everyone speaks at once, and the din is unbearable. That cacophony is the Internet. The only way someone can be understood is if people listen. We could all communicate if we could somehow organize the brouhaha that is Internet. People with worthwhile things to say, which people like to listen to, are content creators. They speak, and others enjoy their speech. People who listen, are content consumers. Back to writing. Writers want to be content creators, and today they have an opportunity they’ve never had before. The microphone is there – all you need is for people to notice you’re talking, listen to what you’re saying, and like it enough to keep listening. Maybe they’ll even pay you to keep talking. So what does this mean? We have this great opportunity, this chance to speak to the world. How do we use, how do we make it work? That’s up to you. But most importantly- Oh, look, there’s a cat playing with an iPad. To see more of Nesher’s material, hack into his email account and read all of his emails. Just kidding, it’s easier to go over to his awesome website — and legaler, too. More legal. Whatever.